This house, originally owned by the Spangenberg family, was purchased by the Czikalla family in 1901. Standing in front of the house are Mrs. Frank Czikalla and her son Leonard Czikalla, Sr., ca. 1905. The Czikalla family owned the property until 2008. The pace of development was still leisurely. The township began building its first sewer and water lines in 1961. The first fulltime employee was hired in 1965 and the first police officer in 1968. The Village of Woodbury was formed in 1967 and by 1974 Woodbury was a city. By the 1970s dairy farming was disappearing, and much of the farmland was owned by investors or retired farmers. In 1975 Woodbury had 2,504 residences, an industrial park, four schools, six churches, a small shopping center, radio stations, Howard Johnson complex, and several office and commercial buildings scattered throughout the community. 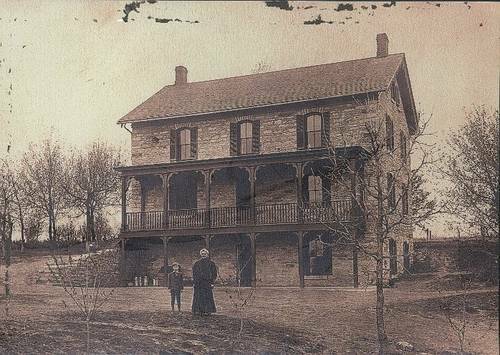 The Woodbury Heritage Society preserves and documents Woodbury’s history and to helps residents of their community learn about Woodbury’s early years. The Woodbury Heritage House and Garden are located at the corner of Radio Drive and Lake Road, in Marsh Creek Park. The house is open the 2nd and 4th Sundays June through September, from 1-4 p.m.
Woodbury is the fastest growing city in Washington County. One of the most rural townships in the metropolitan area has become one of the most suburbanized. In 2000 the city had about 46,500 residents, up from just 10,000 in 1980. In 2012 the population was estimated at 64,496 .